Fahrenheit is a Full Motion Video (FMV) game that was also released on the Mega CD in 1995. Playing as a graduate of the Fire Academy, your job across three missions is to rescue people from burning buildings, capture criminals and dispose of various hazards. Neutralising hazards is crucial, as you're rewarded with additional oxygen. The gameplay consists of a first-person video stream as your character walks through each building, and at certain points you can input your chosen path. 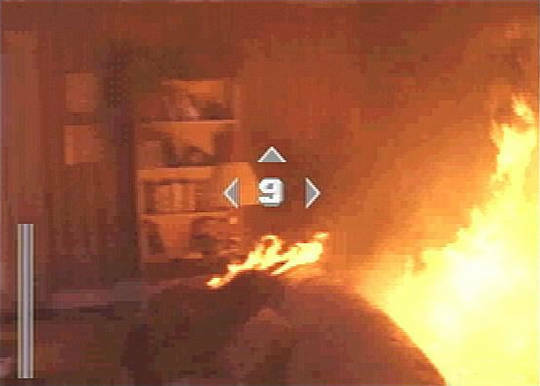 In Mission 1, you navigate a house to locate a trapped girl and then find the exit. It's immediately apparent that many of the on-screen arrows don't correlate with the direction you move towards, and it's common to press Forward, only for the game to swing the camera to a side-door; basically, you're restricted to whatever footage was filmed, leading to serious disorientation! There's also moments of trial-and-error where the game expects you to guess which one of three valves needs twisting to stop a gas leak. Mission 2 sees you searching a hotel to find an elderly lady and her pet bird. It's far more elaborate in size, but seriously confusing. The manual includes handy floor layouts, but in-game you only receive a text-based guide; this results in aimless wandering, and it doesn't help that the same FMV plays in different areas! Mission 3 takes place in the science blocks of a university where you capture a rampaging professor, defuse a bomb and shut off the power; it's an absolute nightmare due to its gigantic maze layout, compounding all of the above problems even further. At least the game's presentation is top-notch (with great special effects), and the full screen video in this 32X port has good clarity. Fahrenheit is a great concept, but the FMV mixed with limited input options replace would-be action scenes with trial-and-error and careless meandering. In truth, there's really not much for the player to do in all three missions, and if you're looking for a more accomplished firefighting game try The Firemen (1994, SNES) instead. Random trivia: In North America, both the 32X-CD and Sega CD versions were packaged together (e.g. never sold separately).